A couple of weeks ago we had houseguests. One of them wanted to head out for Sunday brunch, but I was feeling entirely too lazy to put on real clothes and head out so the only logical thing to do was to stay in and make waffles. Luckily, I had buttermilk, Greek yogurt and fresh cherries in the fridge. Homemade buttermilk waffles with bourbon cherry sauce and honeyed yogurt and no Sunday brunch line-up equals win-win, in my books. These guys are quick and easy to whip up, especially if you get everyone’s to hang out in the kitchen with you and nobody minds if the waffles come out one-by-one instead of all at once like they do at a restaurant. 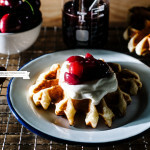 These waffles are fluffy, light and crispy, the yogurt tangy and sweet and the bourbon cherry syrup, well, let’s just say I ate more than my fair share of cherries. All in all, I’d say brunch at home was a success! Make the syrup: In a small saucepan, bring the sugars, bourbon and water to a boil over high heat. Turn the heat to medium-low, add the cherries and let the syrup bubble gently and reduce until a syrup-like consistency. When reduced to your liking, remove from heat and set aside. Gently reheat on low before serving. 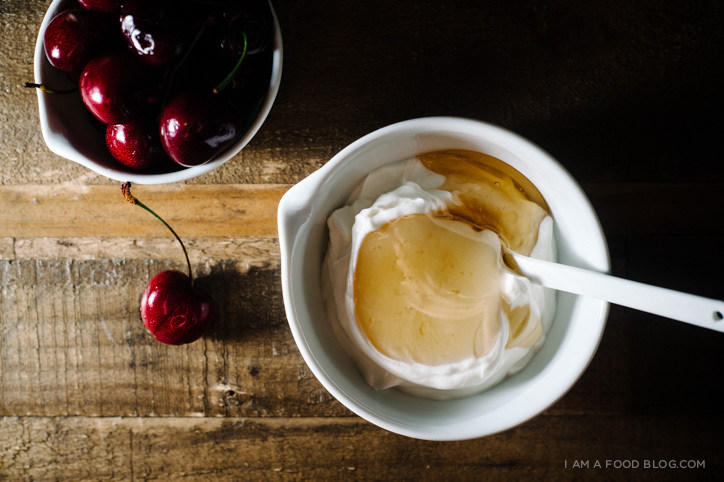 Make the honeyed yogurt: In a small bowl, stir honey into yogurt to taste. Make the waffles: In a bowl, mix together the flour, sugar, baking powder, baking soda and a pinch of salt. In liquid measuring cup, whisk together the melted butter, buttermilk and eggs. Add the wet ingredients to the dry, stirring until just combined. Let sit while you heat up your waffle iron. Grease your waffle iron if needed and cook waffles according to waffle iron instructions or until the waffles are golden brown and crispy. 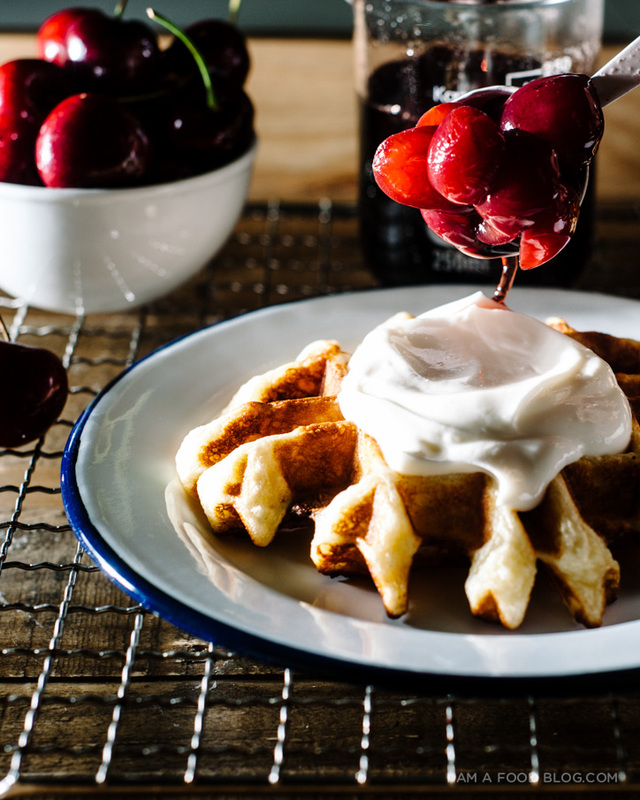 Serve waffles with honeyed yogurt and bourbon cherry syrup. Love when guest challenge me to cook with what I have. You certainly out done yourself here! They are too perfect to eat. YES. I would take this over brunch out a n y d a y. Light, crisp to perfection waffles, plus boozy brunch built right into the cherries … you are the best host ever. 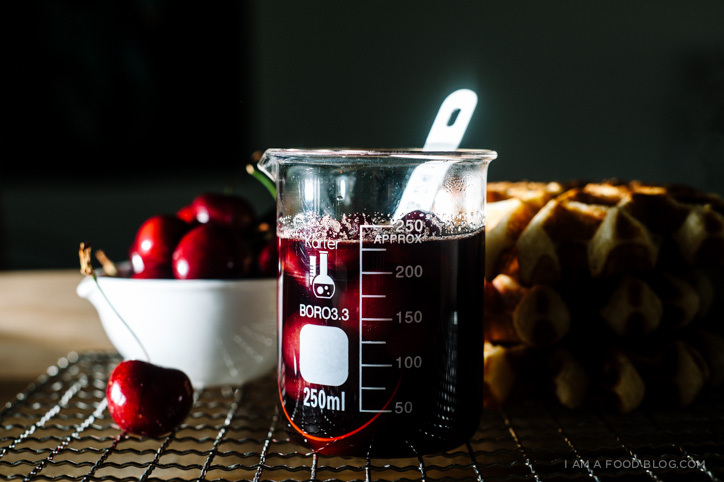 (Also, that last shot of the cherries is magic!) Can it be the weekend again please? Brunch is overrated. Waiting in line for an hour until you’re hangry before you can get eggs and pancakes you can make at home? No thanks. I’ll take these waffles over brunch any day, every day. Looks and sounds amazing – I swear I can almost TASTE it from those photos! 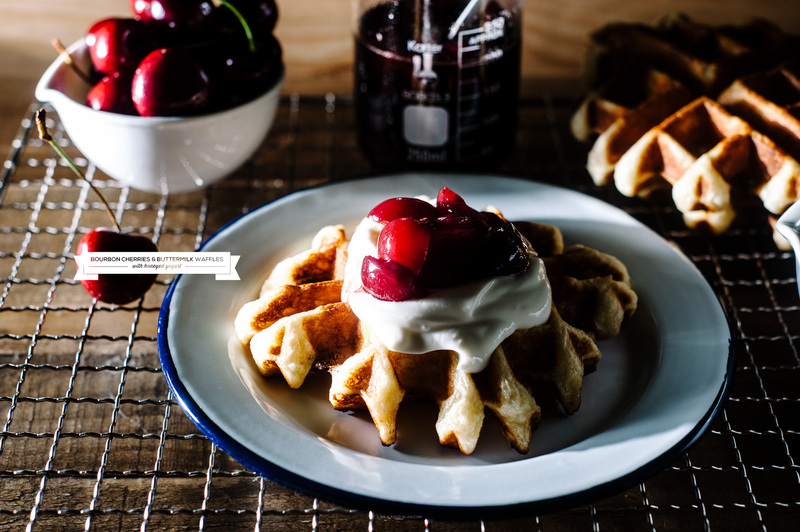 Nothing beats waffles + cherries + bourbon. 3 of my favourite things. Must bookmark this for brunch sometime soon. Wow! I must say you have captured the essence of waffles completely! The lighting and mood is done perfectly. I can taste them all the way from Germany! BOURBON CHERRY SAUCE! Can’t say I’ve gone there yet but I have a feeling we’ll be whipping these up the next Sunday we’re too lazy to head out for brunch! These look delicious! I really hope they convince my husband to skip the whole brunch thing. Brunch is great, but remind me why I’m paying so much for eggs and toast again? Especially when I can make bourbon cherry waffles at home. I actually miss brunchin’ and waffles so much T_T If I can come up with a long enough list of waffle-ble things I might decide to invest in one (waffle pizza/ #awesome)! The bourbon cherry sauce is genius <3 I wonder how it'd come out with wild blackberries mixed in. We have tons around here now. First of all, bourbon. Second, I love how you say it’s easy. Sometimes I get my stuff together in advance, whip up a yeasted waffle batter the night before…but rarely. More often a simple buttermilk batter the morning of will certainly do. Especially with a wonderful sauce such as this. You described my perfect breakfast scenario – everyone hanging out in the kitchen, the coffee is flowing, and the waffles are coming out one by one over good conversation. Lovely..
How decadent!!! You have my mouth watering from these beautiful pictures!! Bourbon cherry sauce on buttermilk waffles!!! So genius and such a great combo. 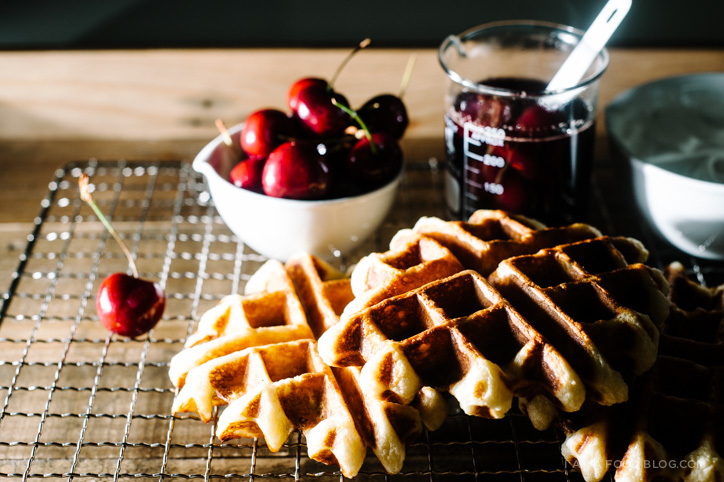 Bourbon and cherries are the best and waffles? You can never go wrong with waffles! That cherry sauce looks heavenly!! These waffles are FAB. Oh man, you know how to get me craving waffles! Alcohol for breakfast with waffles. Yes please! I have eaten waffles twice in the last 4 days. Once for breakfast and once for dinner. I am on a waffle kick. The sauce will really really make my day! Hi! what type of flour should I use for the waffles? I am having some difficulty finding buttermilk in Cyprus, could I substitute it with something else?